The Fred Perry Finn Twill plimsoll leads the casual shoe scene with its simple yet strong silhouette. A grey fabric upper features green Laurel Wreath branding and a 3-eyelet lace up. The slim rubber outsole and cushioned insole finish. A Phoenix VI rises out of the ashes with a cool new colourway. This Fred Perry favourite boasts clean lines with a grey upper and tonal laces. Red Laurel Wreath branding on the midsection and a checkered lining finish. British favourite Fred Perry is a brand that knows a winning silhouette. The Woodford plimsoll is an example of this with its clean and retro lines in great colourways. A navy upper features a tan trim and laces with Laurel Wreath branding to finish. Fred Perry textile low profile trainers with polka dot design. Fred Perry woven check long sleeve shirt with overall spot print design. Fred Perry deliver a low profile silhouette for women with their Bell Leather. A tan upper features a slightly textured finish, four eyelet lacing and an off white Laurel Wreath on the heel. Plaid lining and a slim sole unit finish. A blue and gold colour palette freshens up this contemporary classic from Fred Perry. The Kingston Twill is a plimsoll silhouette created with a canvas upper sat on a slim rubber sole. Laurel Wreath branding finishes. If you like your Tonic with a twist then Fred Perry have a refreshing silhouette just for you. The Tonic Twisted Chambray features a navy canvas upper with contrasting chambray panels and white accents. A vulcanised sole finishes. Fred Perry give a gentlemanly touch to the Fletcher boot. A tan brushed leather upper features a lace up front with Laurel Wreath branding on the tongue and heel. A paisley fabric lining finishes this premium casual look. Women can now enjoy the classic coolness of the Fred Perry Woodford. This popular plimsoll style is made with a white canvas upper featuring stitch detail and navy Laurel Wreath branding. A rubber vulcanised sole gives a casual finishing touch. Fred Perry deliver a classic chukka style boot in the form of their Como silhouette. A navy suede upper features 2 eyelet lacing, plaid lining, leather accents and a fabric rand. Things are finished off with a low profile sole unit. Fred Perry have just the Tonic for new season casual footwear with this uncomplicated, clean silhouette. A navy suede upper features tan piping accents, metallic eyelets and a contrasting red Laurel Wreath. A slim white sole unit finishes. Looking for casual comfort with a vintage twist? Look no further than the Fred Perry Vintage Tennis! With a black fabric upper and classic Laurel Wreath branding in green on the midsection, these are finished nicely with white, green and red accents. 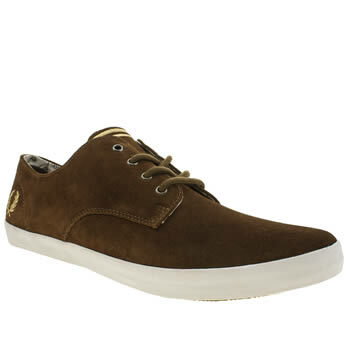 Fred Perry deliver the Clayton and add a desert boot silhouette to their extensive collection. A tan suede upper features triple stitched seams and leather heel pulls with a plaid lining adding a premium feel. A tough sole unit finishes things off. Fred Perry deliver classic tennis style and casual classicism with their Westcliff silhouette. A white leather upper features grey accents through its Laurel Wreath branding, heel tab and trim. The silhouette sits on a slim cup sole. Aubrey II is a super sweet and sporty silhouette from Fred Perry. The low profile plimsoll features a white upper with red Laurel Wreath branding. A checkered insole finishes this update of an old favourite. The Fred Perry Kingston plimsoll gets the leather treatment and is looking darn fine! A black leather upper features red Laurel Wreath branding and tartan trim lining for a premium aesthetic. A slim rubber sole and lace up front finish.